Abstract: How might Russia be understood as an extreme case of the increased gender distrust and relationship fluidity shaping families worldwide? Both women and men in Russia observe that there are few real men, and note an entrenched “problem with men,” especially given the “scourge” of male drinking. This state of normalized gender crisis has important implications for Russia, shaping people’s experiences of the state, society, family life, and the transition to neoliberal market capitalism. However, it also has implications for our understanding of single motherhood and gender crisis elsewhere, including in the United States. Russia is a sensitizing case, one which challenges scholars to move beyond American exceptionalism in studies of families and gender relations. From growing numbers of single mothers and de facto single (but legally married) mothers, to overburdened grandmothers and men who share women’s disillusionment with men and the state, this talk discusses several aspects of Russia’s quiet revolution which challenge Western assumptions about single motherhood, poverty, families, and gender. Bio: Jennifer Utrata is Associate Professor of Sociology at the University of Puget Sound. Her research focuses on how economic and social transformations shape gender and intimate relationships. 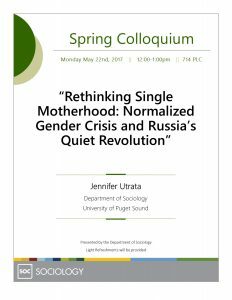 Her book Women without Men: Single Mothers and Family Change in the New Russia (Cornell 2015) won the PSA’s Distinguished Scholarship Award (2017) and the ESS’s Mirra Komarovsky Distinguished Book Award (2016). She has also published in journals such as Gender & Society and Journal of Marriage and Family. Utrata’s current research focuses on how grandmothers’ unpaid care work shapes the transition to parenthood, parents’ responses to the child care crisis, and broader inequalities among families in the United States.